For the posset, bring the cream and sugar to the boil in a pan. Reduce the heat to a simmer and cook for 1-2 minutes. Add the lemon juice and mix thoroughly. Pass through a fine sieve and set aside to cool for five minutes. For the biscotti, preheat the oven to 170C/325F/Gas 3 and line a baking tray with baking parchment. Sift the flour and baking powder together. In a separate bowl, beat the butter and sugar together until smooth and creamy. Add the eggs one at a time with a spoonful of flour each time (to prevent the mix from splitting). Sift in the remaining flour mixture and mix to combine. Fold in the toasted almonds and fennel seeds. Lightly dust a work surface with flour and shape the dough into two fat sausage shapes. Place on the prepared baking tray and slightly flatten the dough. Bake in the oven for 20-25 minutes, or until pale golden-brown. Remove from the oven and leave to cool for 10 minutes. After 10 minutes, slice the loaf into 2cm/¾in thick slices and lay the biscuits out onto a wire rack that will fit in the oven. Place the rack into the oven for five minutes, or until the biscuits are dried out. Remove from the oven and immediately dust with icing sugar. 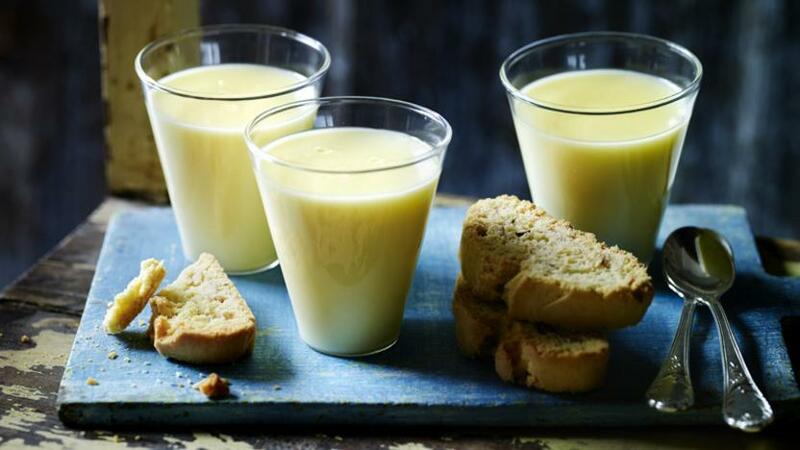 Leave to cool completely before serving with the lemon posset.